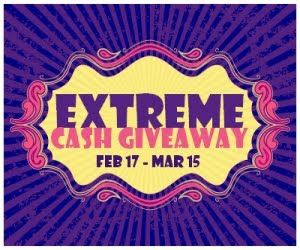 Surviving Madness Surviving Madness: GIVEAWAY: February Extreme Cash! I've teamed up with a group of amazing bloggers to bring you the February Extreme Cash Giveaway! Enter on the Rafflecopter form below - it's fairly quick and easy. The more entries you submit the greater your chance of winning. Do them all at once, or come back every day and do a little at a time - you have an entire month to submit your entries! Giveaway ends 3/15 at 11:59 pm EST and is open worldwide. Best wishes!